Powers/Abilities/Functions: Though appearing small and harmless, the Light Cutter had been stripped for speed and armed to the teeth. Her photonic drive that enabled them to outmaneuver and outrun (in relatively short distance) Zygotean ships. She possessed shields that enabled it to survive flight into and destruction of the core of a Zygotean dreadnought. Possessing minimal life support systems, she was only good for short jumps. She could at least travel from Lartorez to Dreamsend, however far that was. (Epic Illustrated#3/3 (fb)) - Having left Byfrexia some time before, Vanth returned -- armed with off-world weapons, paranormal strength, his sword, and his "blazing killer rage" -- and singlehandedly set the Zygotean invasion back months. Vanth's previous actions were swiftly forgiven, and soon after he was appointed supreme commander of all Byfrexian defenses. (Epic Illustrated#3/3 (fb) - BTS) - Vanth discovered the great caverns in which the Byfrexians hid and operated their air force. He also geared their ships with photonic drive; while unable to match the Zygotean firepower, they could outrun their enemies. (Epic Illustrated#3/3 (fb) - BTS) - The Byfrexians checked the Zygoteans advancement with guerilla tactics, but nonetheless found no way to defeat or drive off their foes. (Epic Illustrated#4/2 (fb) - BTS) - Aknaton used Vanth's ship, the Light Cutter, to transport himself and Vanth to Delloran. (Epic Illustrated#4/2) - Aknaton and Vanth returned to the Light Cutter and departed Delloran. (Epic Illustrated#7/7 (fb) - BTS) - Aknaton mystically warped Vanth, himself, and the Light Cutter across space to save time and get them to Lartorez from Delloran. The Zyogteans apparently detected his sorcerous energies and followed them back to that planet. (Epic Illustrated#5/9) - The Light Cutter hovered just over a mesa while Vanth met with Aknaton's other agents. (Epic Illustrated#7/6) - Vanth listened as Aknaton related the history of the Zygoteans, explaining that galactic destruction was the only way to stop them and the kindest thing for the galaxy; meanwhile, Zygotean mercenaries located and targeted them. 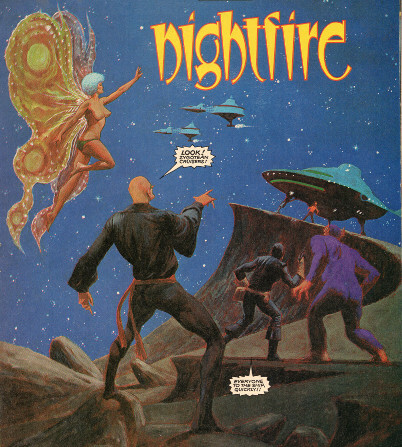 (Epic Illustrated#7/7) - After Aknaton detected the landing and approach of Zygotean cruisers, the group followed Vanth's instruction to get to the Light Cutter. Though pursued by a pair of Zygotean cruisers, Vanth noted that while they were atomic and therefore powerful, they were clumsy compared to the Light Cutter's abilities. Not wishing to have the Cruisers on his tail while he was confronting the powerful Dreadnought just above Lartorez's stratosphere, Vanth allowed the cruisers to catch up to him just above the surface. As Aknaton pointed out that the cruisers were coming in for the kill at point 5.73 and 6.57, Vanth "turned on the juice," executing a quick overhead loop with a point 3.5 turn, followed by a point 5.25 rollback, allowing him to come up behind both cruisers and to send the Zygoteans aboard to Hell. As Vanth flew the Light Cutter out and approached the dreadnought, he correctly predicted that the Zygoteans would see them as a lightweight threat. Waiting for the dreadnought to dispatch another 3-4 cruisers to handle them, he turned the Light Cutter's shields to maximum, flew the ship through the hangar entrance (which was unshielded as the cruisers exited), and fired the Light Cutter's lasers within the dreadnought, destroying its power pods. The dreadnought was destroyed, and the Light Cutter's shields held sufficiently for them to escape the dreadnought's explosion. Aknaton then punched in the coordinates and they departed to their last stop, the planet Dreamsend. 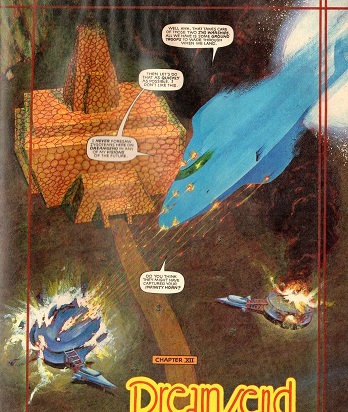 (Epic Illustrated#8/6) - As they approached Dreamsend, Vanth used the Light Cutter to take out two Zygotean warships. Vanth then landed the Light Cutter on Dreamsend, and the crew exited and fought their way past the Zygotean ground troops. (Epic Illustrated#9 - BTS) - The Infinity Horn was activated by Juliet, Whis'par, and Za, and the force annihilated Dreamsend and everything on it (including the Light Cutter) before going on to wipe out the entire Milky Way galaxy.